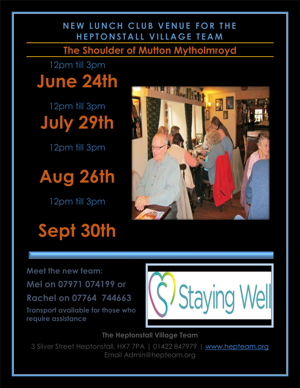 Our first lunch hosted by The Shoulder of Mutton was well attended and enjoyed by all. Here are the dates for our next events. Please contact Mel or Rachel if you need assistance with transport. This entry was posted in Events, Services for Older People, Village Team Upcoming Events. Bookmark the permalink. ← Lunch at The Cross….